I'm not entirely sure what sort of response this will get from people as it's definitely not the typical sort of model engineering that gets featured on here. Also because it's only a static model and designed more for fun than anything else, I felt it was best suited to "tea room topic". If any of the moderators feel it would be better suited in one of the other topics though then please feel free to move it. 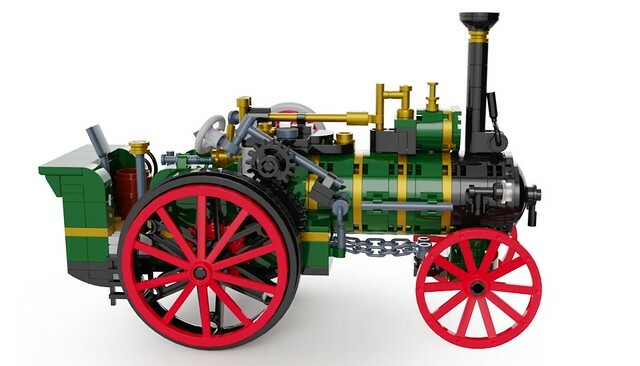 Anyway I wanted to show some images of a Traction Engine I have designed using LEGO. 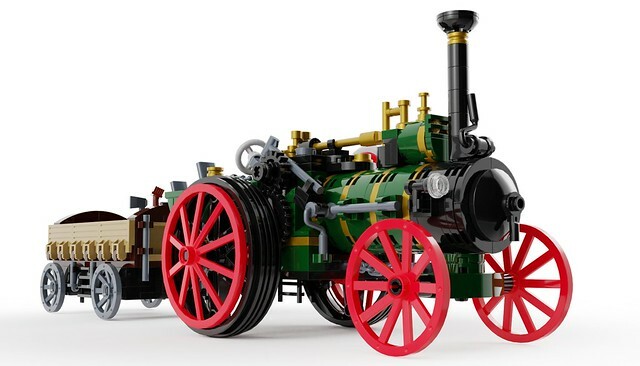 The model features the engine itself in classic green and red livery. The model has working steering, a spinning flywheel and detailed cab interior. Also included is a wagon with drop down sides and various small structures and items that can be towed in the wagon. Hope you like it. I have entered the model in an online contest called LEGO IDEAS. If it receives 10,000 votes from visitors to the Lego website then it will qualify to be reviewed by Lego professional designers with the view to manufacturing it as an official retail Lego kit. Lego don't make it easy to support you, but I did jump thro the hoops for you. Yes it is a bit bit of a drag having to register your email to be able to vote, so thank you very much for taking the time to do that, I really appreciate it. I like it. I've voted and hope it does well. I was pleasantly surprised how keen my niece was to make the Lego kits I've bought her. Not sure if it has the draw of a Millenium Falcon though. Good for you and well done. Nice to see some lateral thinking . I do like it and you will be getting my vote. Thank you very much Rod. 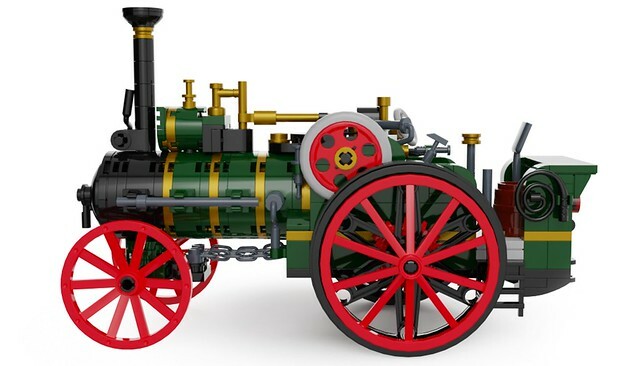 My big hope is that if I was lucky enough to reach 10,000 votes and the model was produced as a set, then it would help to motivate kids and get them interested in Traction Engines and Steam heritage in general. 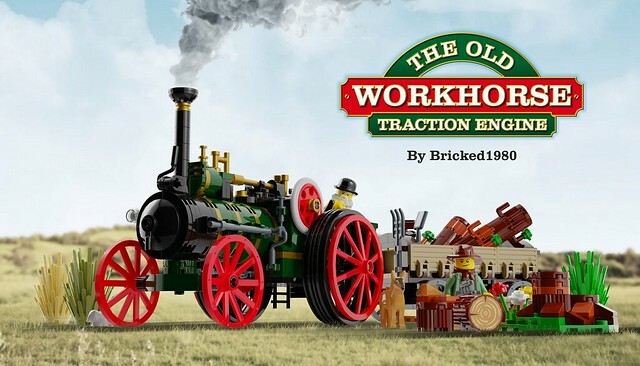 There are loads of kids nowadays who've got no idea what a traction engine is, so I reckon Lego is a great medium to promote these magnificent machines to the next generation. I'm very grateful for that Bill, thanks very much. I've signed up and voted too. My daughter always buys me a Star Wars Lego something-or-other for Christmas to keep me quiet while she plays Scrabble with mum. I will make sure she knows about the traction engine! Many thanks. Thanks a lot for signing up and voting. One of those coincidences. Just this morning about 9:15 on R4 they mentioned that Lego kits are stifling children's creativity as they are designed for making one thing only not the versatility of the plain bricks which encourage imagination. I prefer to see this kind of thing produced as an Airfix kit (whoever does that now) and Meccano and Lego restricted to multifunction component parts. In the most modern equivalent it is like having one computer to run a spreadsheet, and another separate one to run a word processor. I agree with that in many ways. A good example is some of the aeroplane sets Lego have released over the last couple of years. It's difficult to recreate the streamlined shape of a plane using standard Lego bricks so instead they manufactured special prefab nose cone pieces just for these sets. The finished model looks great but there is pretty much nothing else you can build using an element that's been specifically engineered for making the front end of an aeroplane. Having said this though, there are many Lego sets available under the "Lego Creator" range which tend to have more generic pieces and each set offers ideas for 3 different models to be made. So these are definitely designed to promote creativity. I also think that with many kids turning their backs on traditional "hands on" style toys in favor of video games and apps etc, Lego are doing a pretty good job at getting kids interested in model making and using their imaginations. They are one of the few "traditional" style toys that are actually thriving even under huge pressure and competition from modern, digital forms of kids entertainment. I would disagree with the above criticism of Lego. Most of the technic sets do provide more than one model that can be made, and once you have more than one set the possibilities of mixing and matching open up even more. My own three Sons were pretty well brought up on Lego and now all three have engineering degrees, with two of them working for Google. One of them, at about age 10, worked out how to make a differential from just the gears on hand, after I had explained to them how a differential works. So for a reward I had to buy him a set that had the actual Lego parts to make a much smaller diff! I would point out that Airfix kits very definitely only make one thing! I won't get into arguments about the relative merits of Meccano and Lego, I think they are both wonderful. However, when my Boys were of the right age, Meccano was pretty much unknown in the shops here. Of course, now that they have left home, I get to play with all the sets myself, I guess at least until they get around to providing grandkids and they get old enough to make use of it all. 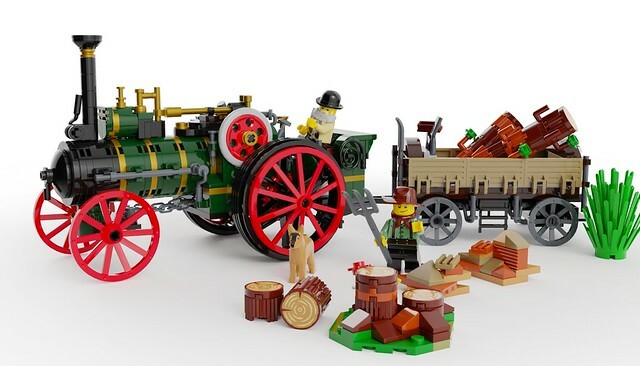 I would dearly love to log into the Lego ideas site and vote for the traction engine, however the login setup is totally borked, it thinks I am trying to set up a new account when actually I was trying to do a password and username recovery. Not up to the usual Lego quality standard! There is actually a very large online community of adult Lego collectors and builders, and I know several of these who started out with Lego as children and have gone on to become engineers and architects. Slightly off topic, but if you are a ME club in south east uk see if you can get the LEGOLAND designers to do you a talk. Really great to see what they do ad how they do it when they basically have thousands of pounds worth of parts to make a life sized dinosaur. One of the failures of thinking with the specific kits is they often avoid leaving any exposed 'pimples' to add on extra bits which would make it the basis fro creative expansion. Like Meccano about 40 years ago tried to compete with Tonka by making some tin trucks etc. Stupidly they did not punch the thing full of holes to promote sales of extra standard parts to add on. These toys are of course very rare now. Worthy of a place in the 'Traction Engines' topic. I've tweeted in support of your campaign to get it to become a kit, but I'm also waiting for a password reset. Perhaps we've broken the Lego website? As a young lad I had the original English stuff to play with, the green/white bricks (and window) are original Kiddicraft the blue brick is modern Lego. The only other thing required was a youngsters imagination! All I have left of the original stuff is these five parts. That's great, thank you very much for tweeting in support of the model Neil, I'm very grateful for that. And thank you for feeling my model is worthy of being included in the Traction Engine topic. That's really interesting to see some pictures of those old bricks. Not a lot of people realise that Lego wasn't the first to manufacture this style of toy. Originally Lego made traditional wooden toys and it was only during the 50's I believe that they started to make the famous Lego system bricks. And this idea was based on the original Kiddicraft blocks that had been patented first in the UK. Supported, great toy is Lego my offspring had loads of fun, now have a great nephew in NZ who’s only 7 and for his age he builds the most amazing Star Wars units — gotta have the engineering gene ! Does anyone remember MiniBrix? Rubber versions of the original Lego pieces and preceded Lego. Then there was Bako (I think it was called) small steel rods that fitted into a plastic base and thin slabs that slotted between the rods, mostly for house type structures.